Create a central hub for your game, structure leagues to support official and community events, sell DLC and physical merchandise, and more—all with premium support from the smash.gg customer success team. Please tell us about yourself Game Developer! League pages are versatile containers that allow you to host multiple events on one landing page, display scheduling information, and publish ongoing performance data for players in your community. 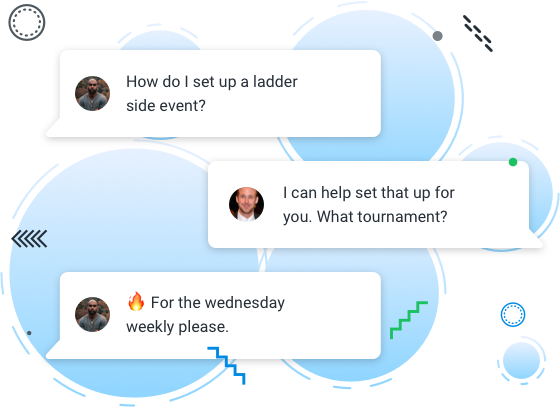 Empower organizers to help build the competitive scene around your game with Event Requests—a flexible administrative and messaging tool to manage licensing and approvals around community events. Organization profiles act as the central hub for your game or brand on smash.gg, allowing you to promote official and community events, publish news and updates, incorporate live data from your tournaments and leagues, and build a community around your game. Developers have access to our premium support services, with dedicated admins from the smash.gg Customer Success team available for tournament and technical support, league setup and maintenance, community management, promotional services, and more. Shops help you monetize and support your game, allowing fundraising for prize pools and event production costs, sales of digital and physical merch, and reward goals to promote community engagement. Better yet, production and fulfillment are handled entirely by a dedicated smash.gg ecommerce team, so you can leave the logistical details to us. Rivals of Aether sought to do what many feel is difficult while launching a game - creating an esport. 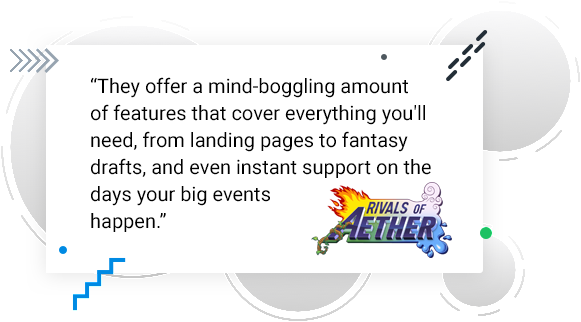 By using a passionate fanbase of organizers and players, in tandem with shops and event requests, Rivals of Aether was able to overlook a teeming game, enhance event experiences, all while managing their own bandwidth and empowering their community. Interested in managing your community on smash.gg?